Black Ace High Profile Belted Chain Sprockets are manufactured with the highest integrity. 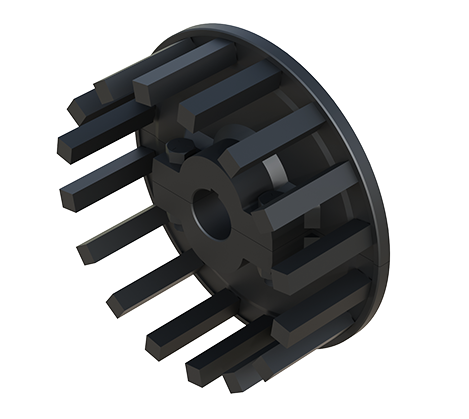 You will find value, as these sprockets are flame-cut and machined with the highest precision available on the market. 14 5-1/2" 6-5/8" 1/2"SQ 1-1/2"
16 6-1/2" 7-9/16" 1/2"SQ 1-1/2"
17 7" 8" 1/2"SQ 2"
18 7-3/8" 8" 1/2"SQ 2"
20 8-1/8" 8-5/8" 1/2"SQ 2"
12 5-1/2" 6-1/4" 1/2"SQ 1-1/2"
14 6-1/2" 7-1/8" 1/2"SQ 1-1/2"
15 7-1/8" 7-9/16" 1/2"SQ 2"
16 7-3/4" 8-3/4" 1/2"SQ 2"
18 8-1/2" 9-9/16" 1/2"SQ 2"
12 6-1/2" 5-1/2" 1/2"SQ 1-1/2"
16 7-3/4" 8-5/8" 1/2"SQ 2"
24 12" 13" 1/2"SQ 2"
16 8-1/2" 9" 1/2"SQ 2"
10 5" 6-1/8" 1/2"SQ 1-1/4"
12 6-1/8" 7-1/8" 1/2"SQ 1-1/2"
14 7-1/4" 8" 1/2"SQ 2"
16 8-1/2" 9-9/16" 1/2"SQ 2"
18 9-1/2" 11" 1/2"SQ 2"
10 5-3/4" 7-1/8" 1/2"SQ 1-1/2"
12 7" 8-3/4" 1/2"SQ 2"
14 8-1/4" 10-1/4" 1/2"SQ 2"
16 9-1/2" 11" 1/2"SQ 2"
18 10-1/2" 11-1/4" 1/2"SQ 2"
12 8" 9-9/16" 1/2"SQ 2"
10 7-1/8" 8-1/4" 1/2"SQ 2"
12 8-1/2" 9-1/2" 1/2"SQ 2"
12 COGS ON A 24 COG PITCH DIAMETER 8" 10" 3/8"WX1"D 1-1/2"
16 COGS ON A 32 COG PITCH DIAMETER 10-3/4" 13-1/8" 3/8"WX1"D 2"
14 COGS ON A 28 COG PITCH DIAMETER 11-3/4" 13" 3/8"WX1"D 2"